In the realm of time and blogs, I feel like I was slightly late discovering Sara’s Sprouted Kitchen. Once I finally found my way, I couldn’t stop clicking through the recipes. While at first my eyes were drawn to the photography, I continued to linger because of the unique approach Sara took to whole foods. I was (and still am) enamored- it is clean, fresh, and above all, delicious. It’s not hard to think of one recipe from Sara’s blog that I want to make. The garnet pilaf has been patiently sitting on my list to make until sweet potatoes come back in season and the second work slows back down, her lentil meatballs are getting made. Each recipe is a true inspiration and a testament that eating whole foods doesn’t have to be complicated and can be fulfilling. So it comes as no surprise that when The Sprouted Kitchen cookbook arrived in my mailbox, it was love at first sight. 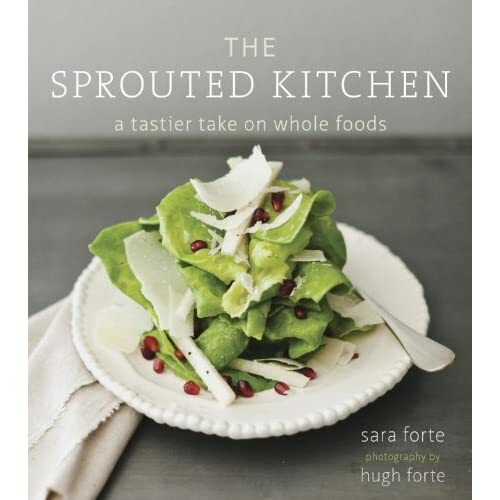 Between Hugh’s photography and Sara’s recipes, the books is stunning (and I don’t use that word lightly). This soup, and so many recipes in the book, are testaments to that statement. The Sprouted Kitchen is available for pre-order right now and will be officially released August,28th (only a few days!) If you like what you see on this site, I highly recommend that you add this cookbook to your collection (and be sure to check out Sara’s blog!) I’ve fallen in love with this cookbook and can’t wait to whip up a few more of Sara’s recipes! Cut the tomato and onion into wedges. Use your fingers to scoop out some of the biggest pockets of seeds. Spread the tomatoes and onion on a rimmed baking sheet. Drizzle with olive oil and sprinkle with 1/2 teaspoon salt, a generous amount of pepper, and parsley. Gently toss with your hands to combine. Tuck the garlic cloves in the nook of the tomato so they won’t burn in the oven. Roast until the tomatoes have broken down and reduced to about half their original size, 30 to 40 minutes. Remove from the oven and let cool slightly. In a large pot over medium heat, warm the broth and stir in the tomato paste to dissolve. Ad all the ingredients from the baking sheet to the broth and simmer gently for 5 minutes. Using an immersion blender, food processor, of blender, puree the soup until it is smooth but still has some texture. If you prefer a silkier soup, pass it through a fine-mesh sieve. Return soup to the pot, turn the heat to low, and stir in the cream. Add more salt and pepper to taste. 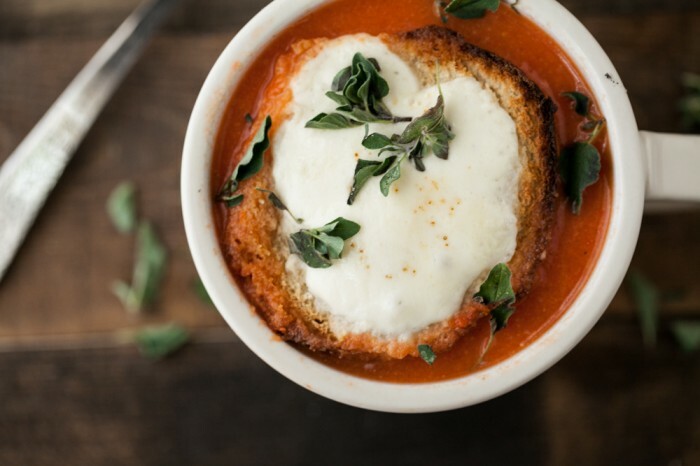 If you’re serving the soup with the cheesy toast, drizzle each slice of bread with a bit of olive oil and a slice of mozzarella cheese. Toast them in a toaster oven or under a broiler until the cheese is melted, about 5 minutes. 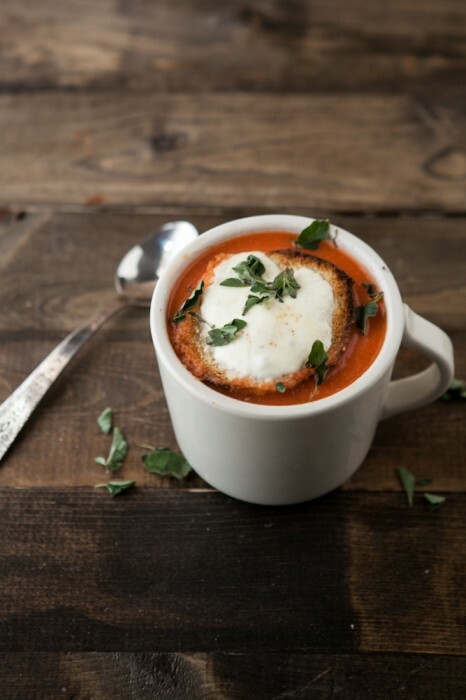 Float a toast in each bowl of soup. Garnish with the oregano and serve hot. 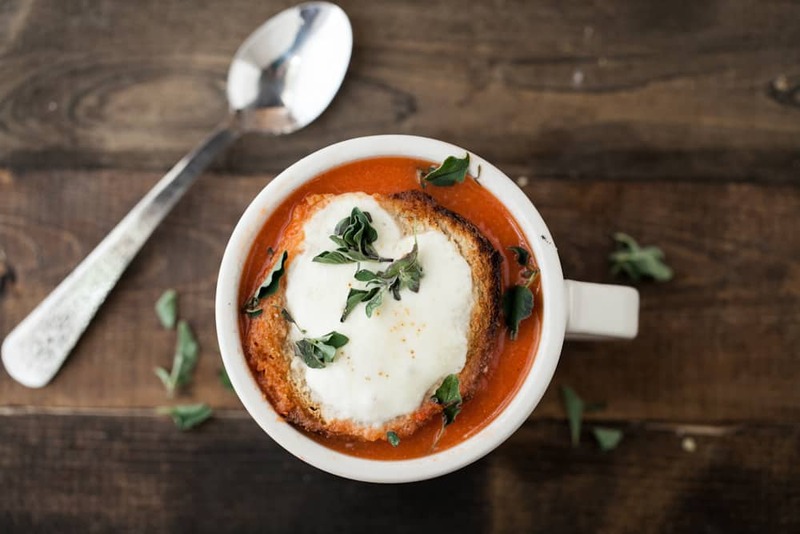 Mmm roasted tomato, wow the flavor of this soup must be stunning! Great job lady! thanks so much, erin! I appreciate the kind words. I love love this soup, and it’s one of the only tomato based things I can get hugh to eat 😉 SO glad you like the book! This recipe sounds delicious Sara…would I be able to can this? Could this soup be canned or frozen? It sounds so delicious and I am looking for a great recipe to have canned. This soup looks so delicious! I can’t wait to get my hands on Sara’s cookbook!!! This does sound like a perfect soup to eat right now, at the peak of tomato time. 🙂 I may make up a big batch and freeze it for delicious winter application! This looks absolutely lovely! I can’t wait to get that book! This is all very serendipitous. I just put a post on my blog asking for cooking blog recommendations. I only subscribed to Sprouted Kitchen recently. But what is lovely is that your blog was recommended to me too. Very much looking forward to reading more. I’ve made the Garnet Pilaf and the Lentil Meatballs more than once! They are both great. I love her recipes. This soup looks beautiful! That looks so lovely and luscious! Need to make it before tomatoes go out of season!!! Amazing soup! Can’t wait to give it a try. This is one of my favorite recipes from the Sprouted Kitchen cookbook. Well, I love all the recipes but this soup was so delicious it just turn a whole day from bad too good! This soup is sooo delicious. And perfect for September. I didn’t actually use the cream or cheese since I can’t have it and it was still really yummy. I roasted the tomatoes and onions the day before so it only took 10 minutes to finish after work. I think this is the way I will make tomato soup from now on. Thanks for sharing this recipe! Awww shucks- thanks Carrie! Happy cooking! I made this for a luncheon with friends yesterday. I can’t get over how delicious this soup is. I had been wanting tomato soup and this recipe hit the spot. It was really easy to make. I can’t wait to make it again. Thank you for this recipe.